A Fox Went Out on a Chilly Night…., originally uploaded by tadnkat. The video above is from almost a year ago, when Mackenzie was only 3 days old, and on our first night home I was singing to her in an attempt to put her to sleep. She instead was watching me interestedly, and didn’t end up going to sleep until much later, but we at least got to share a pretty precious moment together as father & daughter. I unfortunately got the idea in my head though, that she doesn’t go to sleep when I sing to her, so I’ve barely tried to sing her to sleep since then. But tonight, she was climbing all over the bed (climbing on EVERYTHING, really) so I gave it another whirl and sang her “A Fox Went Out on a Chilly Night“. She fell asleep during the last verse. It was just too precious, and was another one of those awesome father-daughter things where she was beaming at me all the way until her eyelids fell down and she went to sleep. Now, while that was indeed wonderful — I’m in a bind. What other great songs are there that a daddy can sing as a lullaby? Good, memorable folk tunes would be best — i.e. not just Metallica’s One sung softly. 🙂 Definitely am open for suggestions. I had to share some of the fun I’m currently having, doing the Having a Happy Baby course at the Founding Church of Scientology in Washington, DC. My wife an I did a fairly good job across our first year with Mackenzie, and now with a baby boy on the way, we wanted to both take advantage of this newly-released course at the Church to get a good grounding simple things we can do to make the next one come out as good as the first. This course is one of a whole plethora of basic courses of study which can be done in any Church of Scientology in the world, and are based on the works of L. Ron Hubbard and center very specifically on various areas of life where Scientology can be of assistance. This one, of course, deals with how to make a happy baby – both before and immediately after the baby is born. The course isn’t meant to replace medical training or texts on the subject, but rather gives simple basics in areas that I’ve found are seriously lacking in other gigantic and ponderous texts that I’ve accumulated in my first year of parenting. How disagreements, anger, and stress in the workplace of the mother can affect the child, and what to do about it. Simple basics on nutrition and medication vital for the expecting mother. How making a happy, healthy mommy affects the production of a health, happy baby. What daddy should be doing immediately after the baby is born. How to help mom recover quickly from the effects of childbirth. There are tons of other things, but that’s a quick few things just off the top of my head. L. Ron Hubbard had an intense love of children and intense care that they be raised well, and as such wrote continually about how various aspects of Scientology should be applied to children and childbirth – both to help the mother, and the new child. So, it’s quite amazing to see all of these data come into play in one package in this course. I’ve even read a number of these before in various books and essays, but as my mind was not on having a baby when reading them at the time, it’s really quite a different experience to get them all as compiled in this book. Scientology parents make the baby part of the family at once. They start talking to the baby. They usually make very, very sure that the baby didn’t have a rough passage prenatally and that the baby had a decent and easy birth. And you’d think offhand that this would simply be fond parental belief that the child was answering up, but it isn’t. It’s amazing. You tell a little baby, if you’re its parent, “We’re going to keep you. It’s okay. We’re going to keep you.” And you always get a sigh! They’re so happy about that. It’s such a relief to them. Really, my hat is off to Mr. David Miscavige for persevering through the work to restore the Scientology Basics, as that’s what allowed all this compilation work to take place in the first place. If you haven’t checked out any of these new Scientology Life Improvement courses, I’d definitely give them a look! Even if you aren’t in the market for a happy baby like we are! Now She’s Walking!! | Ready, Steady, GO!! !, originally uploaded by tadnkat. And for the first two hours (where this video footage was taken) she was just learning a new skill regards walking about every 10 mins. When she first started, she couldn’t turn. Then, 10 mins later, she was turning on her own. Then, she learned to stop & pick up something & stand back up on her own. Then she learned to do it without holding on to anything. It was just bam/bam/bam one after the other. Video: Playing in the Fountain, originally uploaded by tadnkat. Day 303 | Gymnastics Practice, originally uploaded by tadnkat. We’re in the midst of moving, and so took apart the crib to put it into the truck. 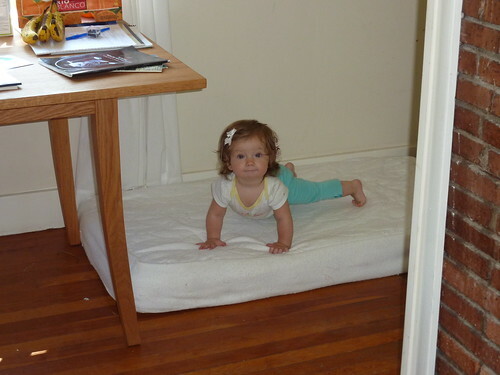 When the mattress went on the floor, Mackenzie thought it would be great fun to start playing on it and doing practice somersaults. 🙂 This picture was taken right after she was trying to execute a somersault by sticking her head between her arms — just didn’t quite have enough oomph to roll all the way over. Day 298 | She’s Officially Walking Today! !, originally uploaded by tadnkat. But this is how the event happened: after mommy and I had been doing some practice walking runs, with the two of us sitting about 5′ apart and Mackenzie taking a step or two on her own, walking between us (like this video here), Kat & I went to do some other work around the house and Mackenzie crawled off to go investigate something in the kitchen. Then, she just pulled herself into a standing position against the oven, propping herself up with one arm, and then got interested in something else. So, without hesitating or thinking, she just started walking away from the oven, and took four good-quality steps before stopping and then pitching down onto her hands & knees to crawl away. Both Kat & I witnessed it – it’s official! 9 1/2 months, and she’s a-walkin! Out kicking tires at the Subaru Dealership, originally uploaded by tadnkat. 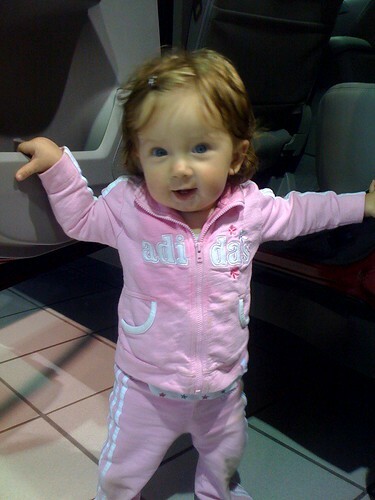 Mackenzie was here examining the rear-seat legroom on the 2010 Subaru Forester.